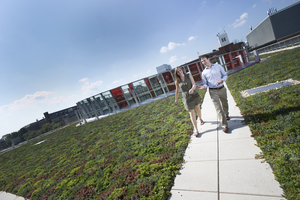 The Physical Sciences Complex (PSC) at the University of Maryland has earned gold certification through the Leadership in Energy and Environmental Design (LEED) program, which is an internationally recognized green building certification system developed by the U.S. Green Building Council. The project is a new 160,000 square foot building located on the university's College Park campus. It is currently the home of the Departments of Physics and Astronomy, the Institute for Physical Science and Technology, and the Joint Quantum Institute. The building includes almost 50 state-of-the-art laboratories and features open interior spaces that facilitate collaborative research. The PSC is UMD’s sixth LEED gold-level certified project and its first LEED gold laboratory building. The facility’s many energy-efficient and sustainable features include energy-efficient lighting and windows; flooring and other materials that use recycled content; reduced water use; a green roof; and plantings that capture stormwater runoff from paved surfaces and filter it into the soil. The building’s green roof also absorbs heat and adds oxygen to the air. “The Physical Sciences Building is a first for the University of Maryland. While we have achieved this level of LEED performance before, this is our first LEED Gold rating for a major research building. This could not have been achieved without the leadership and dedication provided by the entire Project Team, the Administration and the College of Computer, Mathematical and Natural Sciences. This new facility is a crown jewel in our portfolio of green buildings,” said Scott Lupin, Director of the Office of Sustainability and Associate Director for the Department of Environmental Safety. The PSC project team included facilities management capital projects staff Bob Martinazzi (project manager), Steve Cole and Larry Towns (on-site construction representatives). Tom McMullen, Assistant Dean, College of Computer, Mathematical, and Natural Sciences, was the client representative. Project architect was HDR/CUH2A Construction and construction management was provided by Gilbane Building Company. The sustainability consultant was Sustainable Design Consulting, LLC. For more information, visit http://cmns.umd.edu/psc.